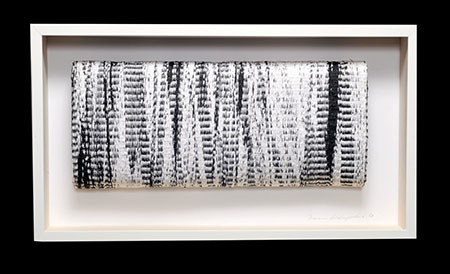 Three years ago, browngrotta arts facilitated correspondence between artist Naomi Kobayashi and author (and collector) William Bayer about the artist’s technique of weaving paper strips with thread. Bayer envisioned a character in a novel weaving a message into her work, which another character would deconstruct to de-code. Naomi provided technical advice — yes, it could be done and the message could be read, if the weaver used oil-based ink. Flash forward to 2014. 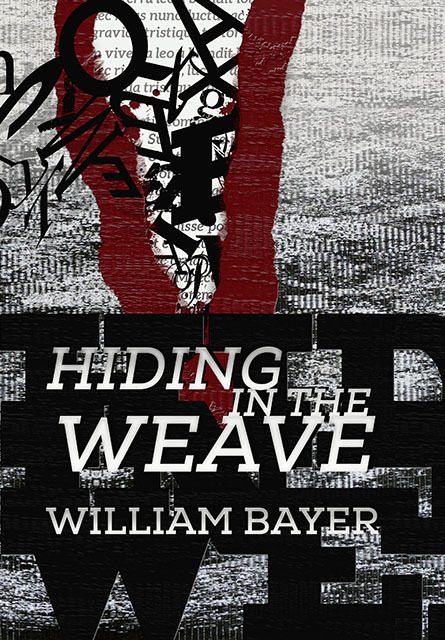 Bayer’s book, Hiding in the Weave, is off the word processor and on the shelves. Written from the perspective of 18-year-old Joel Barlev, a senior at Delamere, a school geared to talented young artists, the novel plays off themes typically found in classic boarding school novels — requited and unrequited romance, alienation, rebellion, sexuality, moral dilemmas and evolving maturity. Joel, a gifted ceramic artist, finds himself falling in love with Liv Anders, a talented weaver, who observes: “You gouge your pots to show your pain to the world. I hide my pain in the weave.” It turns out there is something more tangible hidden in one of Liv’s abstract weavings, and when tragedy strikes, Joel and his two best friends, Justin and Kate, feel compelled to uncover it. Naomi Kobayashi’s work graces the cover; her art informs the content. Get a copy at browngrotta.com.